A few months ago I wrote about solving the problem of missing calendar events from previous months in the Calendar app. Today I received a request for help with a more serious problem. unable to add any event, what do I do now? For some reason, there were no calendars selected for display in Kathy’s Calendar. 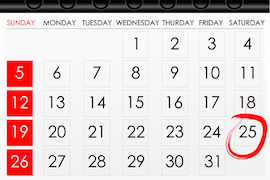 To fix this, go to the bottom of the calendar screen. Tap Calendars. Make sure you have the appropriate calendars selected.